I really shouldn’t be posting this. I should be working on my AP Stats or AP Chem project. I know, right? Who gives projects? It’s the flippin’ year end of the year! But I can’t help myself because today, I took a field trip to the movies! Since we took the APLAC test a couple of weeks ago, and we read The Great Gatsby, my teacher wanted to take us to see the new film adaptation. After reading the book, I wasn’t that impressed; I didn’t understand all the hype surrounding it. Because I didn’t find the book phenomenal, I wasn’t that excited about the movie either… Well until this weekend. My teacher saw the movie ahead of time and she said that it was good, and I heard the same from others. Because of this, I started thinking that maybe it would be better than the book. 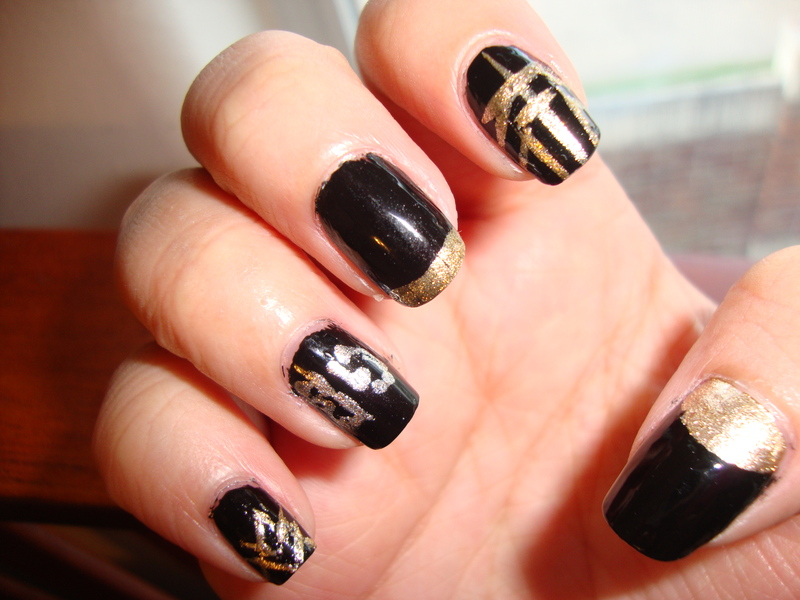 In honor of this, I decided to do a Gatsby inspired nail look! For the designs on my pointer and pinky fingers, I watched this tutorial. Obviously, the tutorial tells you how to do the other fingers, but I didn’t have studs and I didn’t like the rest as much, so I decided to do my own thing. I kept my other fingers pretty simple. For the thumb, I just decided to do a half moon on the bottom of my nail. To do this, I used the paper reinforcement. 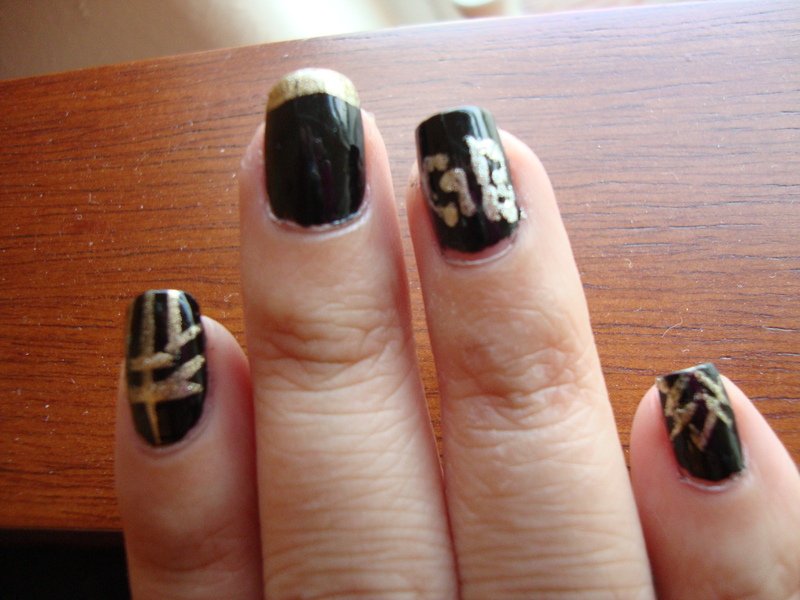 First, I painted my finger with the gold polish, let it completely dry, cut a piece out of the paper reinforcement (to make it more flexible), placed it on my finger, then painted over it with black. For my middle finger, I did a simple french tip. Then, for my ring finger, I used a dotting tool and wrote the letters “GB.” In reality, I should have done “JG”, but I wasn’t thinking clearly. If you want to use Gatsby’s initials, I would suggest using the font from the poster. The “JG” in this poster is a major motif in the the movie, for obvious reasons. So that’s all for this look! It’s not my best, I actually struggled quite a bit, but it was fun! I’ve never really done a “themed” nail look. Really quickly about the movie! If you didn’t like the book, I think you might still like the movie; I did! It’s not as slow as the book and I felt that the changes they made were smart and helped to further the plot. It also cleared up parts that I didn’t understand when I was reading the book. I cried a little, but I’m a pretty maudlin (that SAT vocab ;)) person. But I actually really liked the movie, though I probably couldn’t watch it all the time. Okay, that’s all! I gotta get back to work! 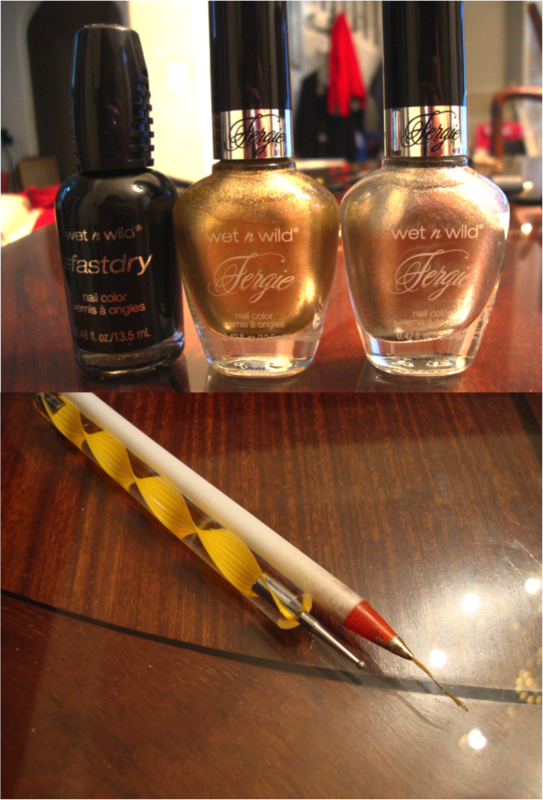 I hope everyone enjoys the rest of the week and I’ll try to have my Ipsy Bag: May 2013 post up this weekend!